The Eurozone is a fragile financial mammoth. While its GDP lacks the US by around $3 trillion, assets of the banking sector are some 240 percent of GDP vs. around 90 percent in the US. It has been kept standing only through the large-scale asset purchase program (quantitative easing or QE) of the ECB. However, the ECB is about to phase-out its bond buying program, which will affect the debt dynamics and the likelihood of euro survival in a dramatic way. The Eurozone has been built on quicksand. The examples of more than 200 former currency unions suggests rather vividly that a currency union needs to be either backed by a political union or it needs to have an exit option. The eurozone, markedly, has neither. It was erroneously assumed that when countries join the European Monetary Union (EMU), their economies would start to converge. This means that it was thought that the poorer countries would start to catch-up to the richer ones in well-being and, e.g., productivity. That never materialized. The convergence that was observable during the first years of the euro halted after the financial crisis hit (see the Figure below). 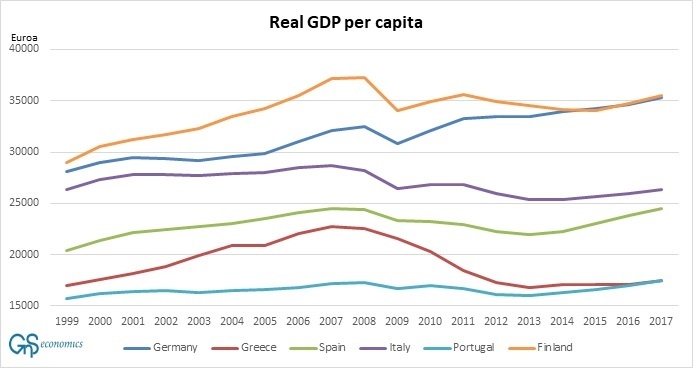 After the crisis of 2008, capital started to flee from the weaker member countries of the EZ (see Figure 2 below). When the run on the capital account of Greece, Ireland, Portugal and Spain started to accelerate in 2011, it pushed them on the verge of an default. Their sovereign defaults threatened to bring down major banks, especially in France and Germany. There was also a risk that defaulting countries would be forced to return to their own currency to support their banking system. 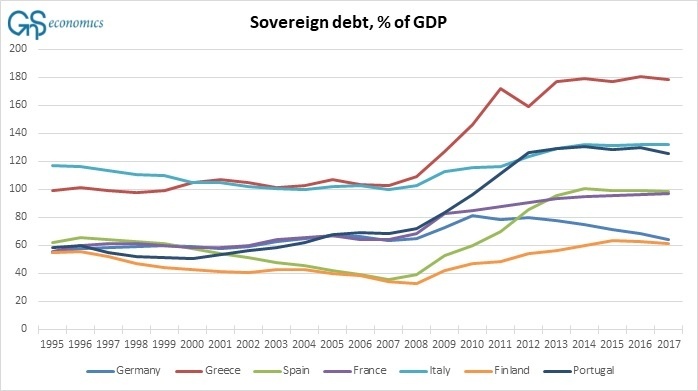 Thus, the 2008 crisis was a classical ‘asymmetric shock’ in the EMU, and the European debt crisis that followed, was in essence a banking crisis. To save face, the European banking system, and, apparently, to stop the EZ from falling apart, leaders of the Eurozone issued bailout loans to the crisis countries so that they could pay back the money they had borrowed from European banks. Alas, only miniscule fractions of these bailout loans went to help the people of crisis-hit countries. The rescue measures applied during the debt crises was probably the most duplicitous and inefficient bank re-capitalization in history. We are thus closing in the first phase, because the ECB is expected to taper (stop increasing its net purchases of sovereign debt) in December. This creates an existential threat for the EZ, because it is all but obvious that the current prices of sovereign debt in the EZ do not truly reflect the actual market estimate of sovereign risk, but only the extent of bond-buying by the ECB. We have been warning about this “risk-hiding” strategy of the ECB for several years (see, e.g., Q-review:s 2/2014, 1/2015, 1/2018). However, the ECB will continue to roll over its existing sovereign debt pile. Because its balance sheet is very large (close to 42% of GDP of the EZ) , even only reinvesting principal produces pressure on sovereign yields. Still, any increase in the net issuance of sovereign debt needs to find another buyer. Everyone should ask themselves, “would I lend to, say, Italy for 10 years at three percent?” to find whether potential buyers will be plentifully available. Thus, when the blanket of ECB support recedes from the sovereign bond markets, the market pricing of risk will return, implying that sovereign yields are likely to become very volatile. It is also uncertain whether the ECB can restart QE, which crucially depends on the decision of the European Court of Justice (ECJ) of QE. If restarting the program becomes impossible, and if “Eurobonds”, some new common financial structure, or foreign central banks do not take the ECB’s place in the bond markets to buy the increased net issuance of sovereign debt before the next banking crisis or recession hits, the debt crisis will make an epic comeback. 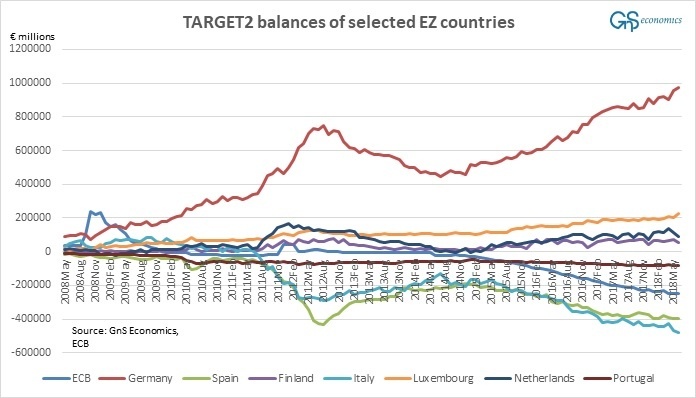 In any case, the over-indebted countries of the EZ face a stark choice, when the recession strikes. Many of them are now even more indebted than in 2010 (see Figure 3). They need to either subject themselves to the bailout programs of the ESM, or default and exit. It is highly uncertain whether countries will be willing to accept the conditions of the European Stability Mechanism (ESM) programs, especially when they know how Greece was treated. Articles 123 and 125 of the Treaty of the Function of the EU (TFEU) also prohibit countries from assuming the financial responsibilities of other member states and forbid any financing of member countries or institutions by the ECB. They seriously limit the ability of the EZ leaders and the ECB to ”do whatever it takes” to save the euro. Markets are about to call the bluff of Mario Draghi. In a breakup, we come to a completely uncharted water, because no country has ever exited from the euro. The uncontrolled breakup of the Eurozone would constitute a cataclysmic shock to the global financial system. Countries, banks and corporations would be likely to default en masse. The ECB would declare bankruptcy due to heavy losses from defaulted sovereign bonds. The European financial sector would crumble taking the global financial system with it. A global financial calamity would follow. Other options do exist, however. The EZ was a bold, but fundamentally-flawed experiment. The fact is that politicians are the ones who got us into this predicament by creating a flawed and inherently-unstable currency union despite the warnings of many economists and the overwhelming historical evidence against the success of such initiatives. There can be no other than a political solution to its problems. We’ll know soon enough whether politicians can find one. Buy Now the full report on the possible breakup of the Eurozone, including global economic outlook and crisis probability and GDP growth forecasts.